Pat Cummins, Australia’s most successful pace bowler over the last four series, has twice struck first in the Test against Sri Lanka at The Gabba. In the first dig, Cummins – bowling behind Mitchell Starc and Jhye Richardson – sent Lahiru Thirimanne packing first with his eighth delivery, the 62nd of the innings. The second time round, bowling behind Starc, Richardson and Nathan Lyon, dismissed the other opener Diluth Kurunaratne first with his sixth delivery, the 24th of the innings. Cummins’ strike rate is phenomenal on what turned out to be an eventful day, with the Australians leading by 162 runs although the Sri Lankans have nine wickets in hand, and still three days remaining. The key to any Australian success is passing the 300-run barrier. Every time the baggy green batting has cracked that number in the first innings over the last 13 Tests that reached a decision, they have won handsomely. Against England at The Gabba in the first Test in November 2017, Australia posted 328 to win by ten wickets. Against England in the second Test at Adelaide in December 2017, Australia cruised to eight (declared) for 442 to win by 120. Against England in the third Test at Perth in December 2017, Australia went even better with nine (declared) for 662 to romp home by an innings and 41. Against South Africa in the first Test at Durban in March 2018, Australia scored 351 to win by 118. And against India in the second Test at Perth in December 2018, Australia posted 326 to win by 146. Five wins in 13 completed Tests should become six in 14 when The Gabba is decided. 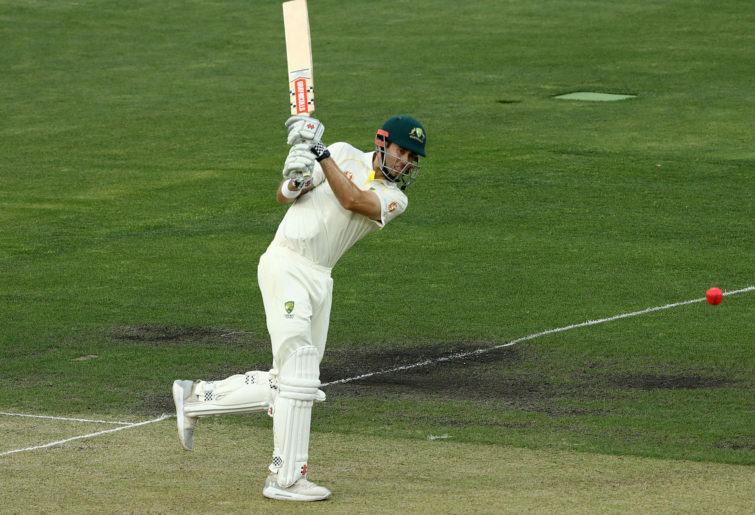 Australia posted 323 yesterday thanks to Marnus Labuschagne, Travis Head and the new boy on the block Kurtis Patterson batting as you would expect from Test men, protecting their wicket as though their very lives depended on it. Not so teammates Marcus Harris, Joe Burns, Usman Khawaja, Nathan Lyon, Tim Paine, Cummins and Richardson, who all departed to low percentage, even stupid, shots to pay the ultimate penalty. Labuschagne and Head knuckled down to some spirited Sri Lankan bowling, but they sure weren’t hand grenades. If there’s to be any criticism, it’s the inability of this side to turn over the strike so they get bogged down with inertia. Yet, they posted the first 50 partnership of the Test, only the second century stand for Australia this summer after Aaron Finch and Harris’ 112 for the first wicket against India at Perth, finishing with 166 off 277 deliveries. Most of their partnership was at a funereal pace, but they were showing the others that occupancy and patience can be rewarded. When Australia was 4-101, Head was eight off 28, Labuschagne two off 33. At 4-140, Head was 24 off 49, Labuschagne 23 off 66 and, at 4-195, Head was 47 off 101, Labuschagne 54 off 111. Labuschagne was first out with the Australian top score of the summer – 81 off 150 – with just three fours. Head topped that with 84 off 187, with ten fours, but both denied themselves their first Test tons – and the first for Australia this season – by forgetting how they got there, protecting their wicket. It was a double waste. The 192cm leftie Patterson with a pencil thin frame, took 14 deliveries to score his first Test run, finishing with 30 off 82 with four to the rope, but showed enough to prove his selection was warranted. It took a 26-run cameo off 25 from Mitchell Starc to crack the 300 barrier when Labuschagne, Head or Patterson should have still been in the middle. But beggars can’t be choosers in a side that, by normal Australian batting standards, is well below par. They have Sri Lanka by the throat, and a win would be more than welcome. No doubt Pat Cummins will have the major say in that.